I have a special subgenre of books that I call “gutwrench” books. This subgenre is reserved for books that literally (wait, that is what “literally” means, right?) rip your guts out when you read them. They are the antithesis of light and breezy, they deny facile endings, they are not “tweetable.” Consider Cormac McCarthy’s Blood Meridain, or Marcus Zusak’s The Book Thief. These are books whose elemental truths stay with you long after reading, even when you might wish their discomfiture would let you let them go. 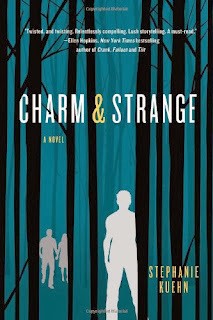 To this subgenre I now add Charm & Strange by Stephanie Kuehn. Depending on your science background, you may recognize “Charm” and “Strange” as the names of two kinds of quarks. According to scientists, quarks are the very stuff of existence, akin to the “omnium” Flann O’Brien wrote about in The Third Policeman. Kuehn uses the elemental nature of quarks as both metaphor and a structural device. Quarks, after all, make up everything with matter, but perhaps what matters most contains no matter at all. 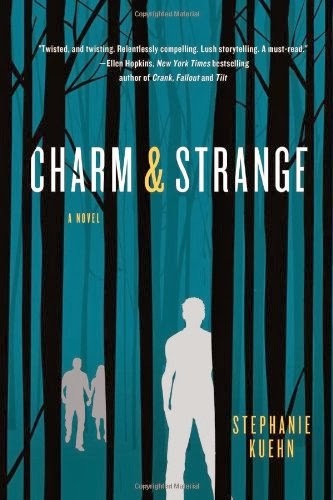 Charm & Strange is more strange than charming, and how you feel about those two adjectives will go far in determining how much you will like this book. Personally, I am skeptical of charm (even my own), and intrigued by strangeness. Win, our narrator, is undeniably strange. He admits it himself, and everyone else thinks it to. This strangeness is part affectation to ward off social intrusions, but it is not enough to prevent the curiosity of Jordan, the new girl at Win’s prep school. And Win’s remaining strangeness is earned, as is slowly revealed through harrowing time jumps to Win’s childhood. But is his strangeness an elemental part of him, or can he learn to overcome it? To reveal any more would be to reveal too much. Intricately plotted, Charm & Strange builds tension masterfully, and the “reveal” is subtly and devastatingly made. I devoured this ravenously, like the feral creature Win is convinced lives inside him. I cannot praise it highly enough: Charm & Strange matters. I love this review, because it's the first one I've read that mentions quarks. I've been insanely curious about whether that element of the title was on purpose or if physics had just warped my brain.